This school year I have been writing and posting on my new blog, Day In the Classroom. I recently realized that some people are still visiting this blog, so I am going to double post to both blogs. 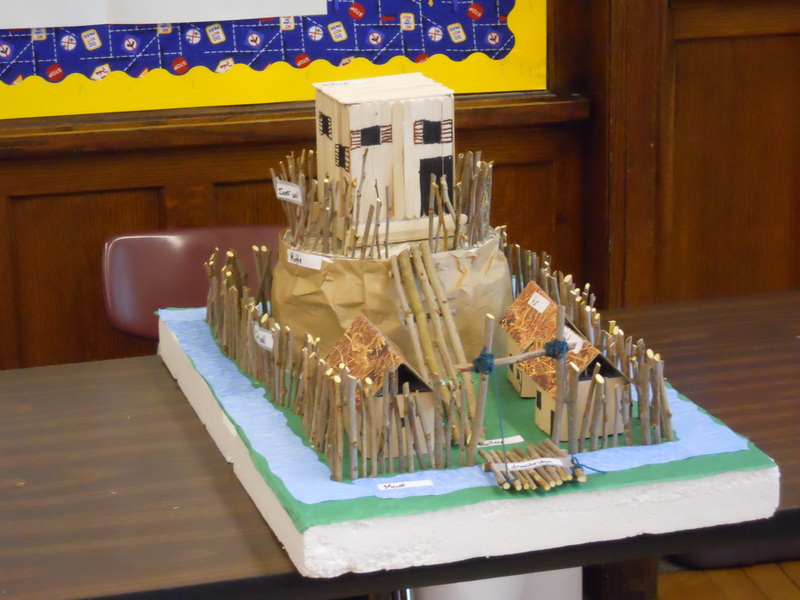 This post includes some material from a post last year about the castle project that I do with students. Phillips is a Core Knowledge School. We are also a public school, so we teach the regular school district curriculum, and in addition we teach most of the Core Knowledge Content. 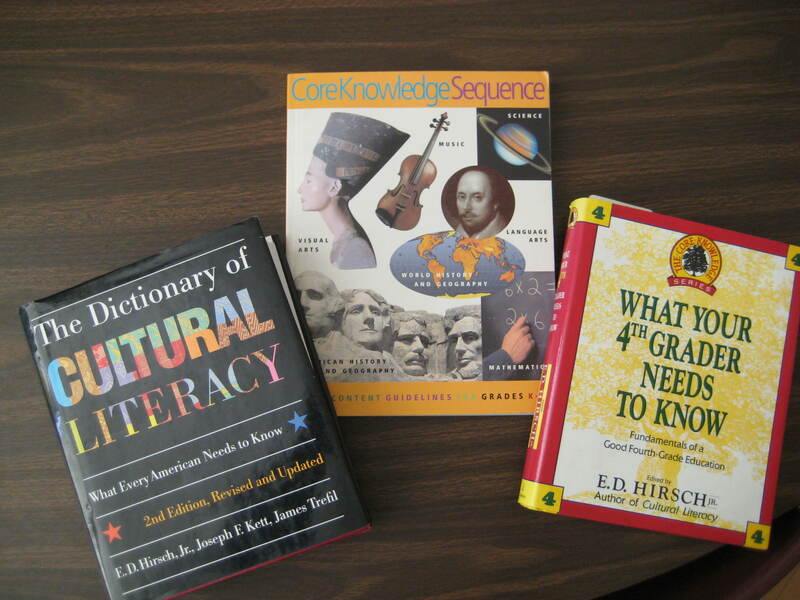 Core Knowledge is based on the writings of E. D. Hirsch, author of Cultural Literacy. You can learn more about it by visiting the Core Knowledge Foundation Website. Our first graders learn about ancient Egypt, the third grades can tell you about the Roman empire, and in fourth grade we learn about the Middle Ages. As part of our study, my students build castles. We completed our castle project last week. It is completed as a homework project, and it is one of the highlights of fourth grade, or so some people tell me. I have done this project for fourteen years. I did quit for a few years because the castles had become so elaborate and huge, and they had become “Dad Castles” instead of “Kid Castles”. I make it a point to tell families that they may assist, but it should be mostly the child’s work. When students bring their castles, we always interview them about how they planned and built their castle. When asked what they liked best about the project, many respond with something they did with their parents, so I do allow family help. I have restrictions about the size of the final castle. It had gotten to the point that some castles were the size of two or three student desks. I now request that they are no larger than the top of a student desk. Because I didn’t want to cause a hardship for any family, for a few years I offered the option of making a poster instead of a model. Only one or two students per year ever chose to do that. When other students asked them why they made a poster rather than model, the answer was that they thought it would be easier. Since I don’t want to offer a “lazy option”, I dropped that this year. We begin in class by learning why castles were built, and how they were built. Castles weren’t just houses, they were war machines. 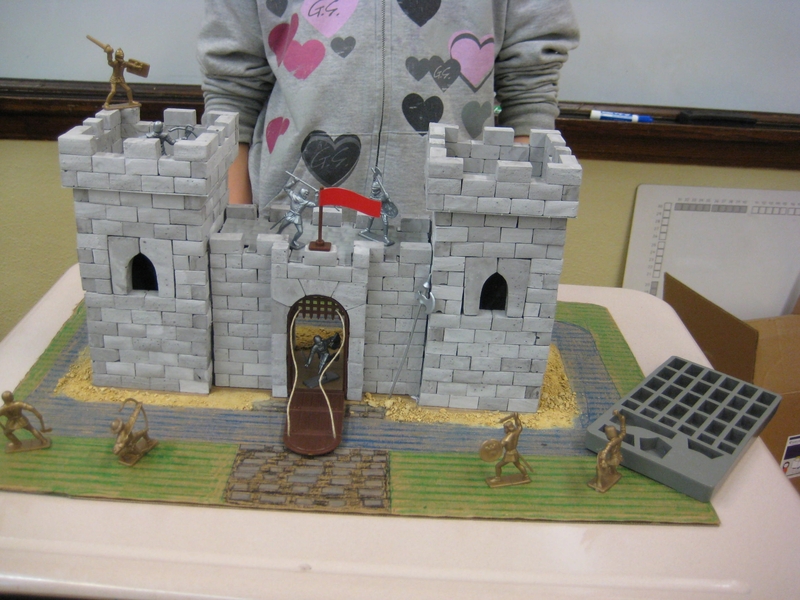 We learn about the planning that went into the defense of these castles, and children are encouraged to include these details in their models. I am a big consumer of manilla folders, and I use them for this project. I staple step by step directions for the project on the left side of the folder. You’ll can find a copy of these directions in the file cabinet. On the right side I include diagrams labeling the parts of the castle. We do several in-class lessons about the parts of the castle, and whether it was for offense of defense. I also include ideas about possible ways to construct a model. 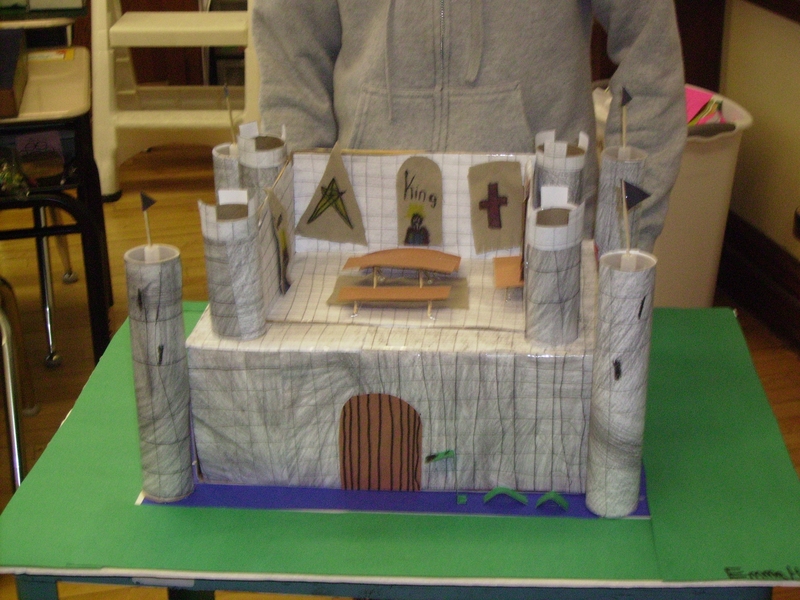 Most of my ideas come from the books, Knights And Castles, By Teacher Created Materials and The Middle Ages Independent Learning Unit, By Lorraine Conway. 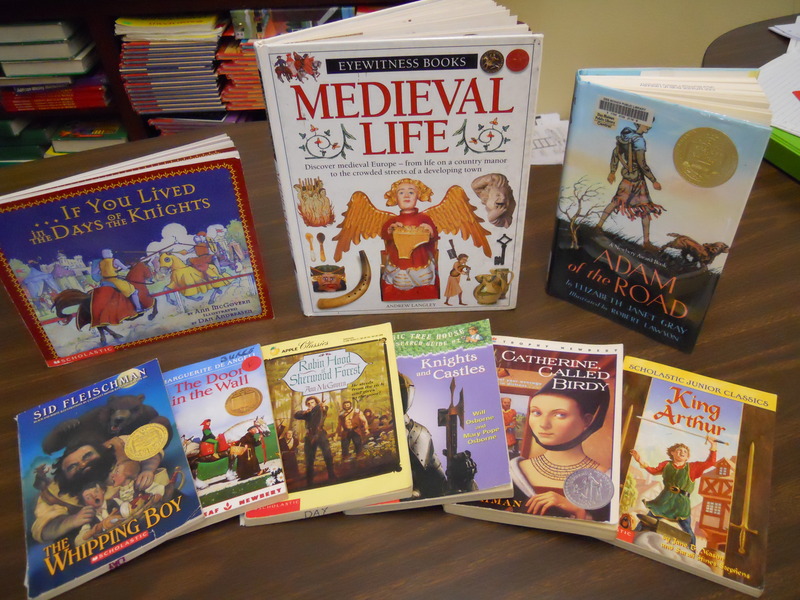 You can read more about the resources I use in my previous post on this blog, titled Medieval History for Kids. The kids and families never cease to amaze me with their creativity. I have seen castles made of wood, cardboard, styrofoam, sugar cubes, marshmallows, sand (that was not such a good idea), clay, craft sticks, and rocks. Every year, there is some new idea that I would never have thought of and have never seen before. This year one of my girls brought the mold that they used to make all the blocks that they built the castle from. She explained to us how she mixed the “cement”, formed the blocks, removed them from the mold, and let them dry. It was fantastic. We do a lot of writing. We write about why castles were built. We write about the kids’ thinking and planning for their castle. Kids write a description of their work to be displayed at Core Knowledge Night. At the end we write fairy tales about what happens when an evil wizard shrinks us and our castles become real. On the day the castles are due, we invite students from other grades to come see them, which is why kids come into 4th grade asking when we’re going to build castles. 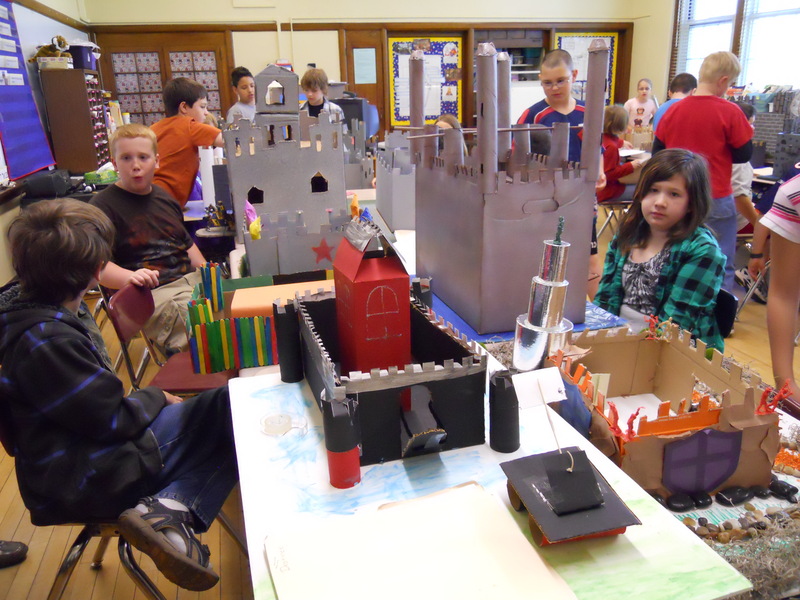 All the castles pictured in this post were created by my students from this year. 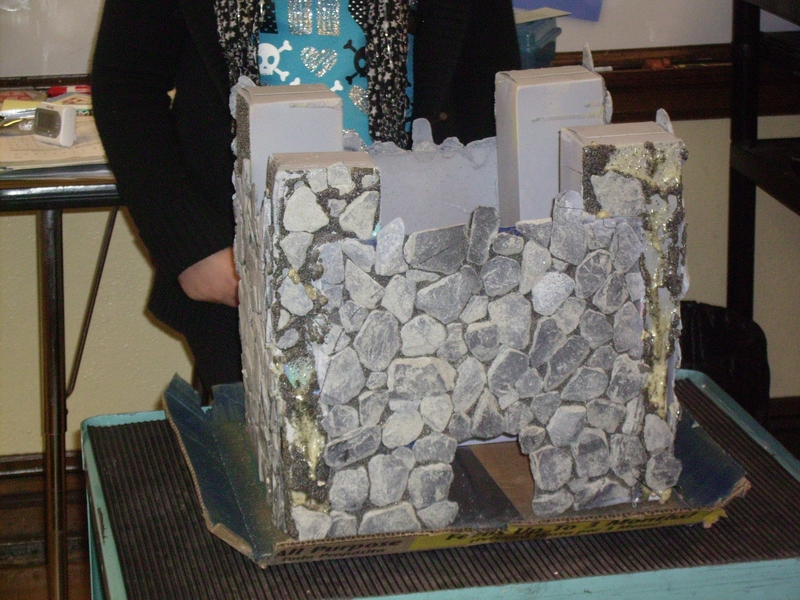 I made this Animoto to celebrate our castles and Core Knowledge Night. 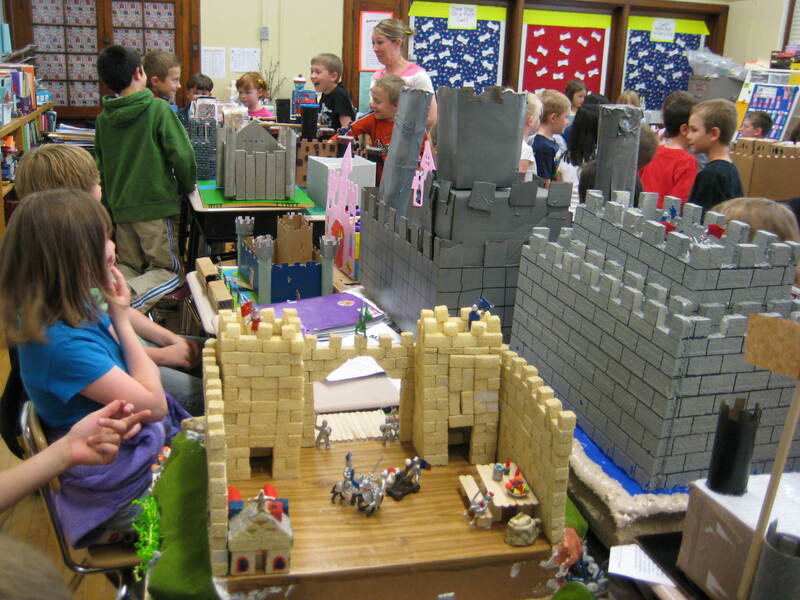 Our castles were due Wednesday, May 4th, which was the day before we had our big school celebration, “Core Knowledge Night”. Now we have them displayed in the office, library, and above our lockers. Our classroom was full of castles of every shape and size. Thursday, May 6th was Core Knowledge Night. This is the time when we show families all the projects we’ve been working on. 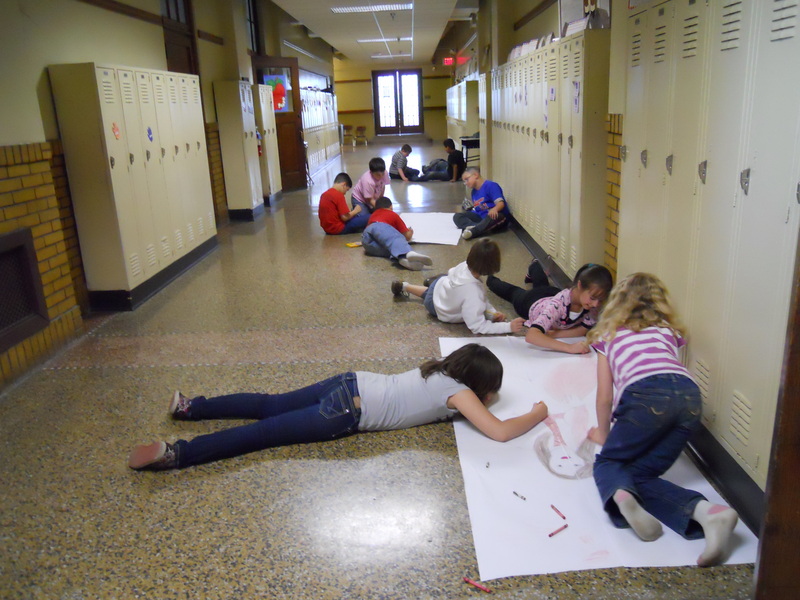 For fourth grade we displayed things we had done for the American Revolution and the Middle Ages. 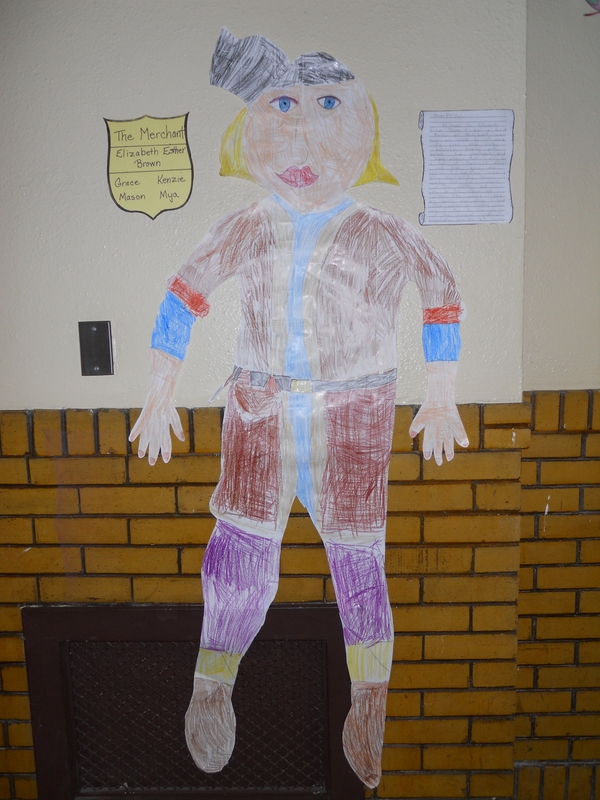 We had our Giant Medieval Paper Dolls and their letters on display in the hall. I wrote about this project in an earlier post. After reading The Door In the Wall, each person designed their own coat of arms. There are several resources that have good information about heraldry. I like to use Medieval Times from Teacher Created Materials, Inc. Page 27 has a key to some of the symbols that were used in heraldry. You will find a pattern to use for your shield on page 28. The size of the shield we make is usually dependent on the supplies I have on hand. This year I just ran the shield pattern onto cardstock, and we have displayed them on our lockers. Other years I make them larger, and students trace a pattern onto larger posterboard or cardboard. 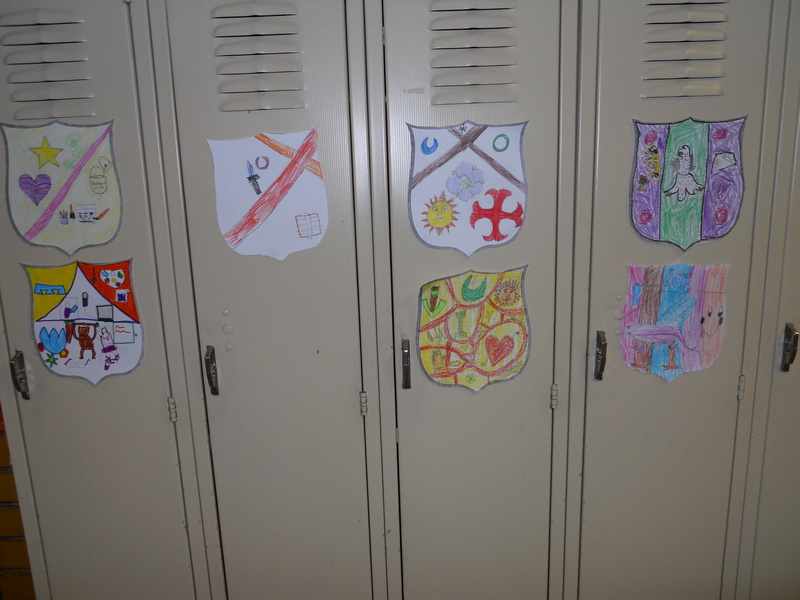 Each person created their own coat of arms, and we used them to decorate our lockers. Our castles were due on Wednesday, May 5th, and they were incredible! Every child completed the project with two making posters, and the rest building models. 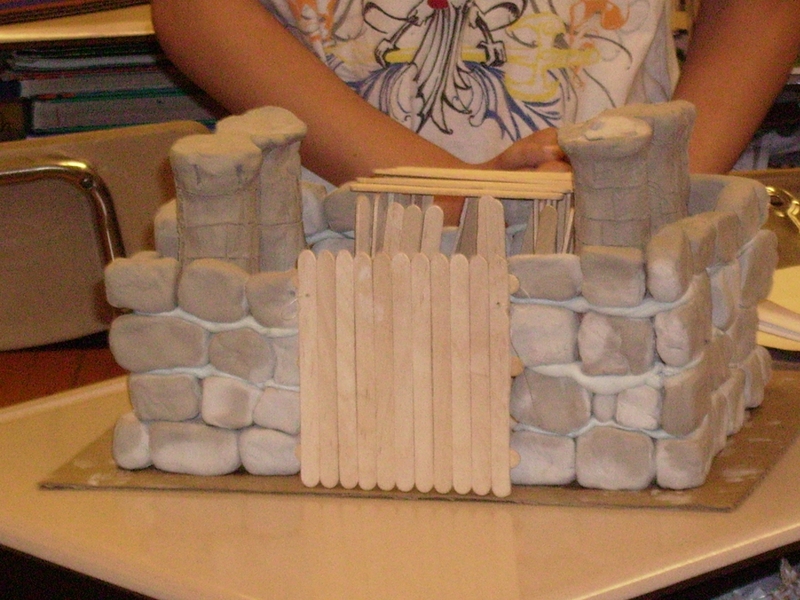 We had castles made with cardboard, wood, sticks, sugar cubes held together with frosting, and styrofoam. They were very impressive. One of the girls made a motte and bailey castle. These were the earliest castles built, and they resembled our early American forts. The keep was built on a hill (this was the motte) that was often made with the dirt that was dug from the moat. The castle and bailey (the yard) were surrounded by a wooden fence. The drawback was that attackers used to burn the castles down, which is why they began building them from stone. Visitors from other classes come to check out our castles. We had lots of visitors in to see the castles on Wednesday and Thursday. All the kids were able to explain the construction of their projects. 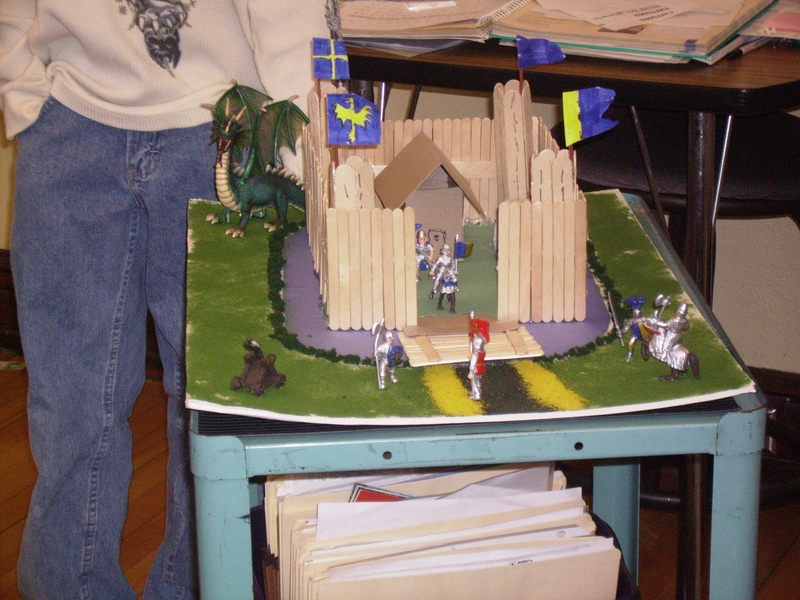 Each student presented their castle to the class. We interviewed them and asked questions about the materials used, who helped, what they were proudest of, and how their castle is like a real castle from the middle ages. I always take lots of pictures, and this year I experimented with a Flip Camera that was just acquired by our school. 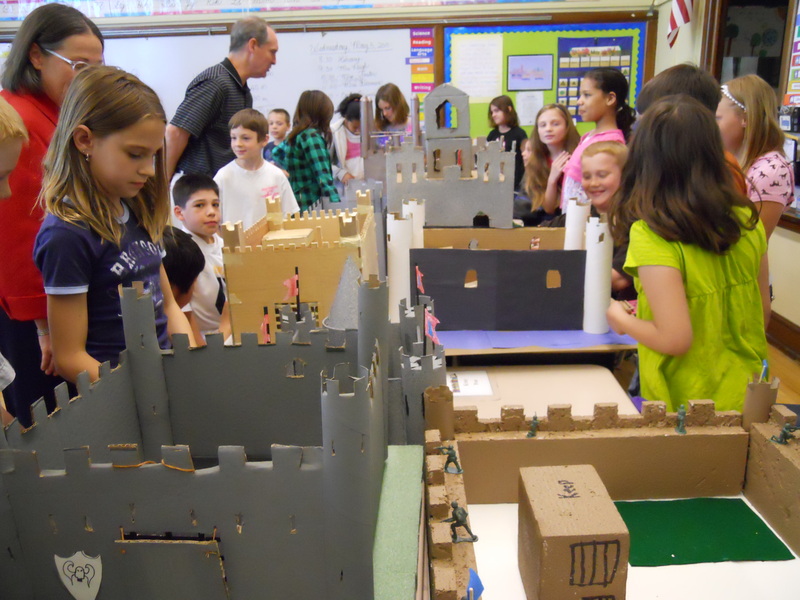 It was the day of the Core Knowledge celebration, and room 205 was full of castles. Ms. Day’s 4th graders entered the classroom, but Ms. Day was nowhere to be found. Instead, there was a very strange looking substitute sitting behind the desk. Instead of a school bag, she carried a cauldron. Instead of a Phillips sweatshirt, she wore a long black gown and cape . Instead of a pencil, she carried a wand. Her name was Miss Magica. Miss Magica put that wand to use, just as soon as the class began talking. There was a crash and a bright flash of light. It started with a tingling from your fingertips all the way to your toes, and before you knew it you found yourself shrinking so small that you could fit inside your castle. There was another flash and crash, and the wind began to blow. Your castle with you inside, had been transformed into real stone and wood, and was spinning through the air, back in time to a land far far away. Write about your adventure! We worked all this week to finish writing and post our fairy tales on our Kidblogs. We have also included a photo of each person’s castle. 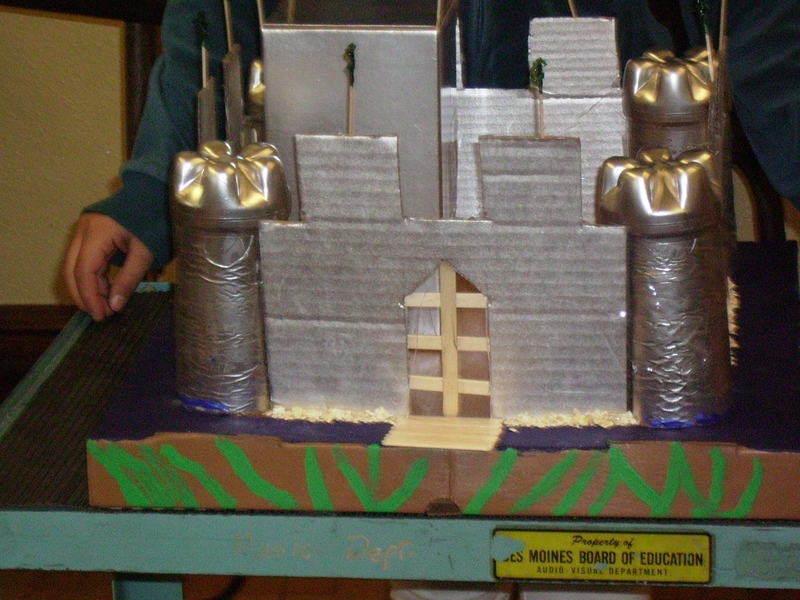 You can read their fairy tales and see more of their fantastic castles by visiting http://kidblog.org/msdaysclass/. We welcome your comments. It’s been a very successful unit. The kids have learned a lot, and they have been enthusiastic, but I think we’re all ready to move onto something new. This is Lady Maria. She is a noble woman. 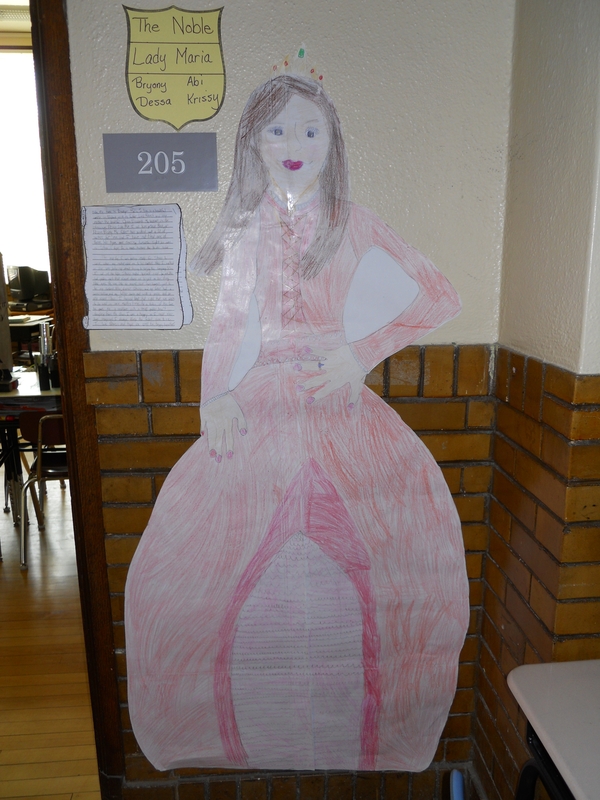 For the last two weeks, we have been working on our Giant Medieval Paper Doll Project. This is a group project that we do to learn about how the people of the middle ages lived. I got this idea from the February/March 1997 issue of The Mailbox–Intermediate. Several times a year, I like to do something in the way of a research project with my students. With 4th graders, this means I bring in the books, and we learn how to use the table of contents and index to find the information we need. This year, with my new ventures into technology, we have also used the internet. Usually I order a box of books about the topic, in this case — the middle ages, from our area education agency. I also have a very large classroom library, that I have collected over the years. 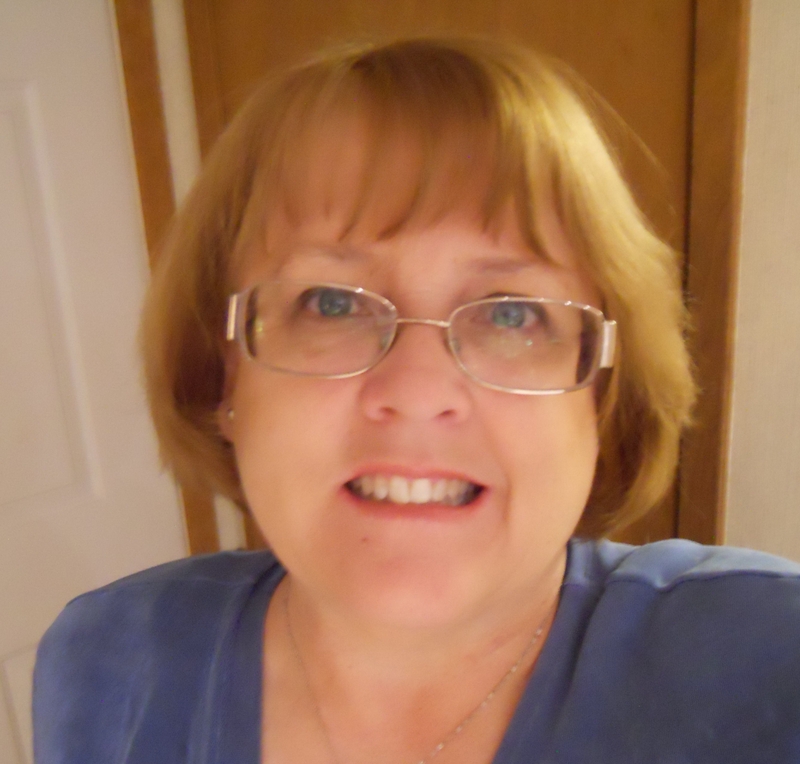 This year I also found some helpful websites, which I added to our Read the Web class wiki. Brother Lucas is a Monk. I always begin by having the kids do some reading about their person. 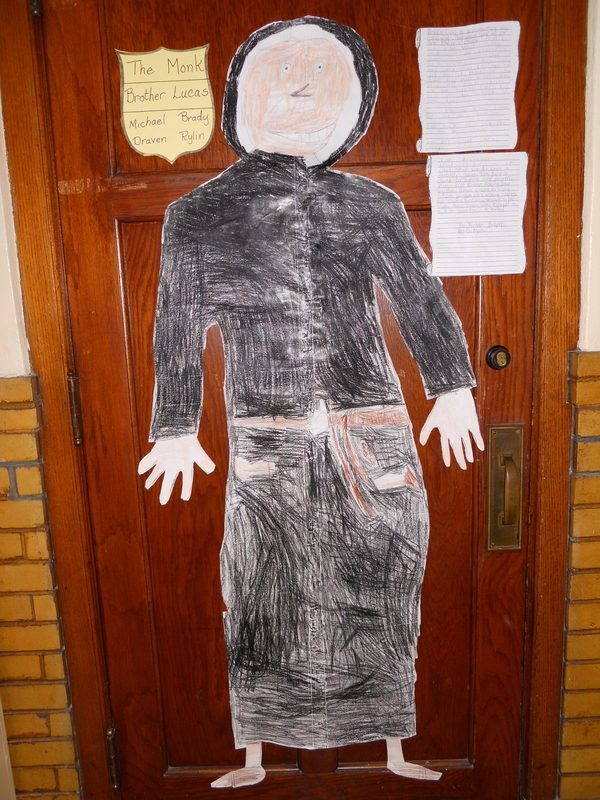 We look for information about how the person lived, and what kind of clothing they wore. Here are the steps for creating the paper doll. Have one group member (usually the smallest) lie down on a large sheet of paper. Bulletin board paper, butcher paper, or brown wrapping paper work well for this. 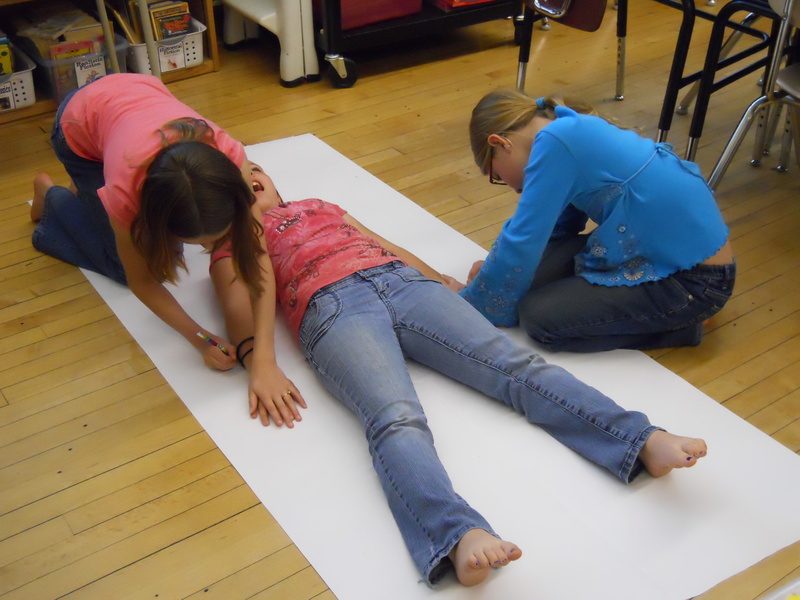 The other members of the group trace his or her body to make the outline of a giant paper doll. I love watching the kids collaborate to do this. Trace around one member of the committee to get the shape for your paper doll. Students research the follow information about their medieval person: In what kind of home did this person live? What did this person wear? What did this person eat? How did this person spend his or her day? What hardships did this person face? In what way was this person important to medieval society? I provide each group with a folder (remember I love using manilla folders) with a note taking form that includes questions. You can find some examples in the file cabinet. After the group has answered these questions, draw eyes, hair, and other facial features on the paper doll. Decide on a name for their person. Work together to dress the paper doll by drawing clothing that matches the information gathered while researching. Draw on the clothing with crayons or markers. Some people have even created a collage by adding paper or fabric scraps. Dress your medieval paper doll by drawing clothing and accessories. Cut out the paper doll. On drafting paper work as a group to write a letter from your person to the class. Use the information you have gathered to talk about your person’s life in the middle ages. Be sure to write in first person. Your person is helping the people of today to understand their life in the middle ages. Revise and edit your letter, and copy it on final draft paper. I use paper made to look like a scroll, but you could use anything that you like. Display your letter and paper doll. I make it a point to tell families that they may assist, but it should be mostly the child’s work. When students bring their castles, we always interview them about how they planned and built their castle. When asked what they liked best about the project, many respond with something they did with their parents, so I do allow family help. I have restrictions about the size of the final castle. It had gotten to the point that some castles were the size of two or three student desks. I now request that they are no larger than the top of a student desk. I do not wish to cause a hardship for any family, so I allow the option of creating a castle model or a detailed poster. Almost all the kids create a model, and in all the years I have done this project, I have never had a student fail to complete it. I am a big consumer of manilla folders, and I use them for this project. I staple step by step directions for the project on the left side of the folder. You’ll find a copy of these directions in the File Cabinet. On the right side I include diagrams labeling the parts of the castle. This is actually one of our in-class lessons. I also include ideas about possible ways to construct a model. 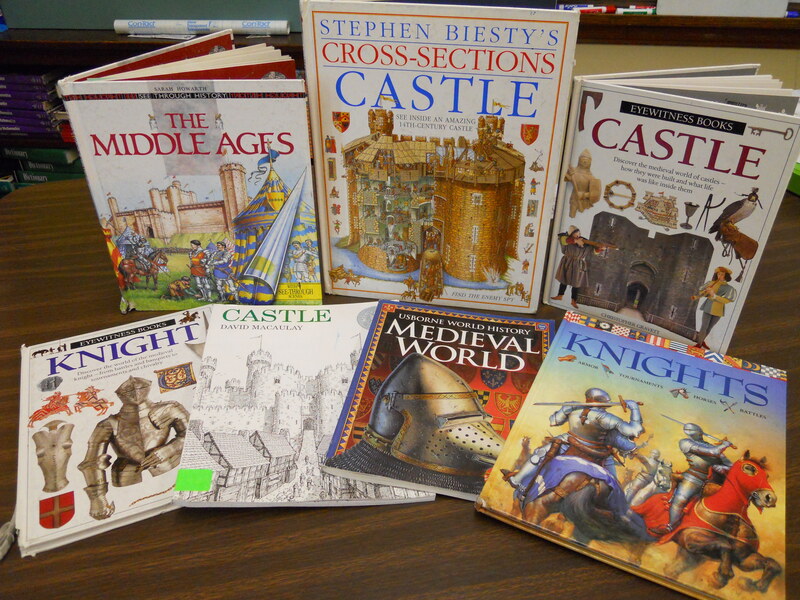 Most of my ideas come from the books, Knights And Castles, By Teacher Created Materials and The Middle Ages Independent Learning Unit, By Lorraine Conway. 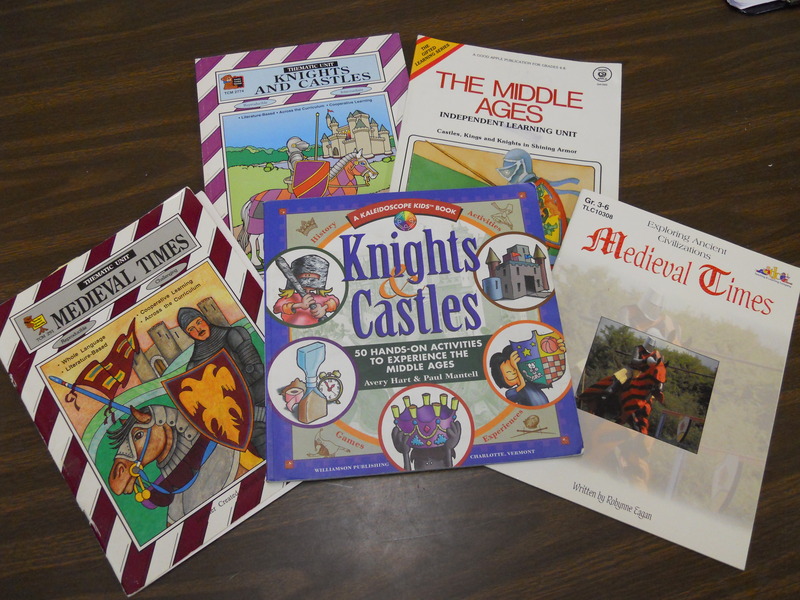 You can read more about the resources I use in my previous post, Medieval History for Kids. The kids and families never cease to amaze me with their creativity. I have seen castles made of wood, cardboard, styrofoam, sugar cubes, marshmallows, sand (that was not such a good idea), clay, craft sticks, and rocks. Every year, there is some new idea that I would never have thought of and have never seen before. 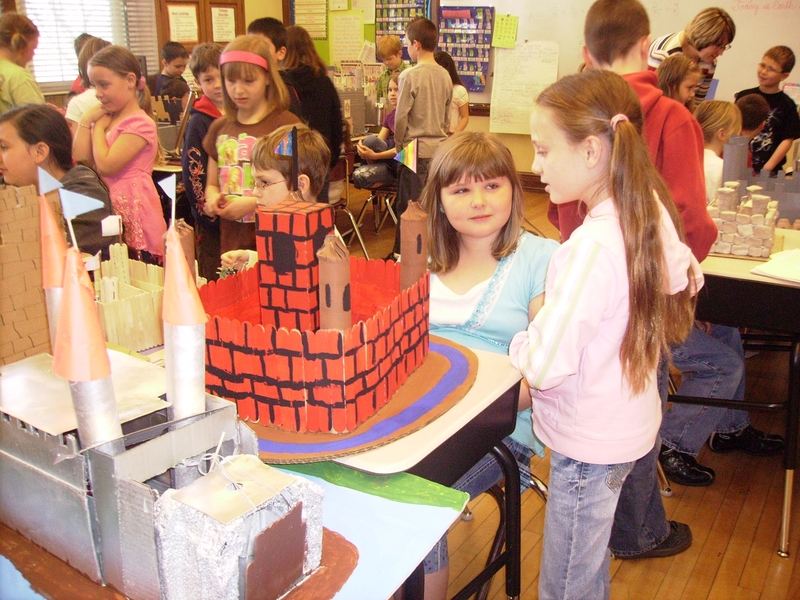 The third graders come in to check out our castles. On the day the castles are due, we invite students from other grades to come see them, which is why kids come into 4th grade asking when we’re going to build castles. 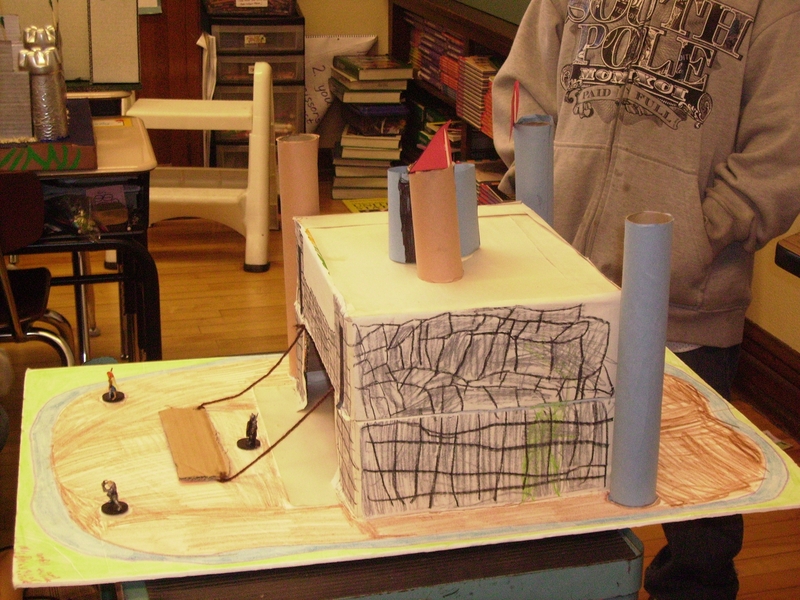 All the castles pictured in this post were created by my students from last year. This year our castles are due on Wednesday, May 5th, the day before we have our big school celebration, “Core Knowledge Night”. Afterwards we will display them on top of our lockers and in the library. My school is a Core Knowledge school, and one of the highlights of the year is our study of the middle ages. We begin by building a timeline, so that the kids understand how this period of history fits in. This is easier at a Core Knowledge school, because the children have already learned about ancient Egypt in first grade, ancient Greece in second grade, and the Roman Empire in third grade. You can learn more about Core Knowledge curriculum by visiting The Core Knowledge Foundation website. I also include some map skills, because I want to be sure that the children understand what part of the world we are talking about. It is important to compare and contrast maps from the middle ages with Europe of today. I like to teach Core Knowledge across the curriculum. While some of our medieval history is taught during social studies time, much is done during our literacy block and even during math. I usually start with small group reading groups exploring non-fiction. King Arthur (Scholastic Junior Classics) by Jan B. Mason and Sarah Hines Stephens. As we build this background, we stop to explore some things in more depth. As we learn about feudalism, I impress on students and help them to imagine what it would be like to have their dad pick who they would marry. I want them to think about what it would be like to be sent away from home at the age of 7 to become a page. I want them to appreciate the freedoms we have today to make choices about the work we do, and the opportunities we can take advantage of. I try to fill the room with non-fiction to read during free reading time. There are some great books out there to use to learn about the middle ages in Europe. Here are some of my favorites. We are beginning our Castle Project this week. My next few posts will talk about some of the special projects we do to further our understanding of life in the Middle Ages. If you have additional ideas, I would love to hear them.